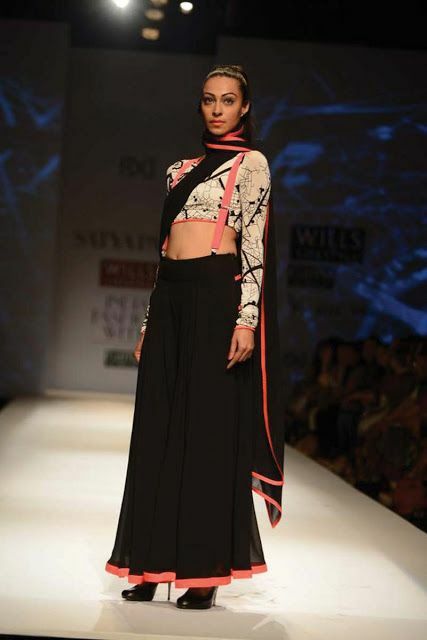 Masaba Gupta designer sarees have become the next hit sensation when it comes to designer wear. The House of Masaba has increasingly started to take over the designer sarees space. Masaba Gupta, the mastermind behind the House of Masaba has been to all the places a designer must go, to become the next hit sensation when it comes to designer wear. A young girl herself, her designs and creations cater to girls between the ages of 18 and 30, which can be seen in her designs. Recently her creations were showcased at Lakmé Fashion Week, to huge applause. 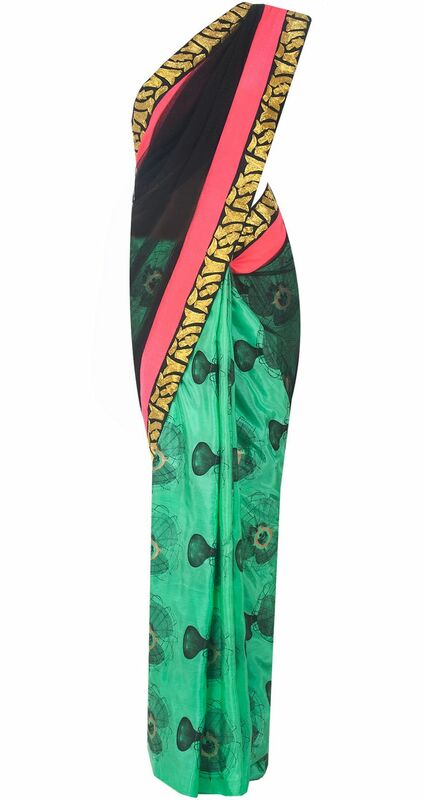 Let’s move on to what I like to call, how to spot a Masaba saree. First, look for her characteristic combination of dull colors paired with bright, attention-grabbing ones. She has a way of making even the most unheard of combinations work really well together. She keeps her borders filled in with gorgeous, eyeball grabbing colors like hot pinks, greens and golds. The colors complement each other to create one smashing outfit. Next, look for the quirky print she flaunts in her sarees. Some of her motifs may be commonplace, like flowers, leaves and your regular been-there-done-that stuff, but the way and manner of usage is so different it immediately looks like something you have never seen before. Then of course, there are her super cool prints which cover typography and motifs like cameras, people, and hands. Giant polka dots and psychedelic prints also are a part of her creations. Masaba doesn’t shy away from using something nobody has seen before. She takes the risk of creating what she thinks will work, and boy, does it work! Finally, she takes care that even while draped, her sarees will give the audience a different impression. More often than not, her blouse designs deserve attention for how well they complement the saree. My favorite is the peter pan color of the otherwise extremely normal blouse, that really brings out the contrast in the saree and the blouse. The bottom front of her sarees are drastically different, so different in fact that they seem to be a part of a completely different outfit. Either there’s a design element like a typo, or a gorgeously bold color that takes the whole saree up a notch. We have seen Masaba drape her sarees using suspenders of all the things in the world and the outfit still looked fantastic. We have also seen her work one of the looks with a translucent kurta-esque jacket of sorts which brought out the colors of the saree and added the glamour quotient. 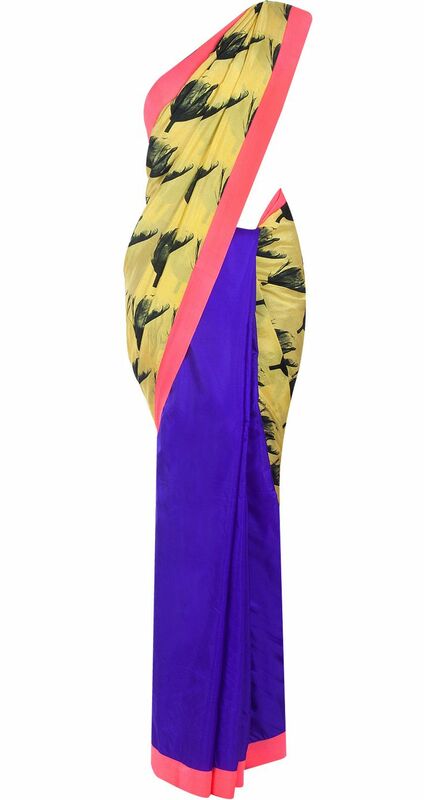 All in all, if you are looking for something different to flaunt this festive season, you cannot go wrong with a Masaba Gupta designer saree.